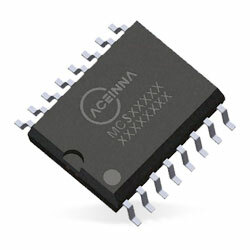 ACEINNA MCR1101 Current Sensor ICs, available now from Mouser, are ±5A, ±20A, and ±50A fully integrated bi-directional analog output current sensors. These sensor ICs deliver high accuracy and high bandwidth. The sensor ICs incorporate the Anisotropic Magneto Resistive sensor technology that offers inherently low noise, superior linearity, and repeatability. These sensor ICs are ideal for both high-side and low-side bidirectional current sensing and provide a high bandwidth of 1.5MHz (3dB). The sensor ICs are intended to remove sensitivity to stray and common mode magnetic fields. These sensor ICs’ inherently low output noise bypasses the necessity of additional filtering at low currents. The sensor ICs are offered in SOIC-16 package and support high isolation. These sensor ICs are UL/IEC/EN60950-1 certified and find their applications in current sense feedback loops in motor, inverters, uninterruptible power supplies, and power factor correction.